I have been searching for this bourbon for a while now, and I finally got a hold of a bottle of Old Grand-Dad Bonded. Most people are familiar with Old Grand-Dad, mostly because of its shout-out in George Thorogood’s “I Drink Alone.” The standard Old Grand-Dad offering is bottled at 86 proof, but it is offered at several different proof points. 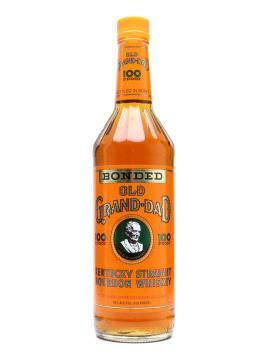 Today, I am reviewing the 100 proof Bottled-in-Bond edition of Old Grand-Dad. Today, the Old Grand-Dad Distillery is owned by Jim Beam, which makes the other namesake bourbon of the old granddad of bourbon, Basil Hayden. For those who have asked me about it, Basil Hayden is the man pictured on the label of Old Grand-Dad. Like Basil Hayden’s, Old Grand-Dad is manufactured with Basil Hayden’s signature high-rye mash bill. On the nose, Old Grand-Dad Bonded is spicy and citrusy. There are notes of wood and rye spices, backed up with a big corn sweetness and dried orange peels and lemon peels. In my opinion, the rest of the bourbon is a bit too controlled by the prickly rye spices. The palate has notes of the charred barrel, chili powder, black pepper, and some corniness. The finish is hot and spicy, with the same notes of char, chili powder, and black pepper. However, the finish does become more complex with notes of cocoa dust and roasted corn that keep it going for a long time. Overall, Old Grand-Dad is a solid bourbon, especially if you like a robust, spicy rye-character. I am not a big fan of the rye bourbons, so it is not my favorite. I definitely prefer Wild Turkey 101 to Old Grand-Dad if all other factors were equal. However, at $20 a bottle, it is pretty hard to find a better bourbon than Old Grand-Dad Bonded. My grade: C. Price: $20-25/750ml. This is a nice mixing whiskey, especially when blended with other bourbons.